Canadian public companies will have to follow International Financial Reporting Standards as of January 1, 2011. 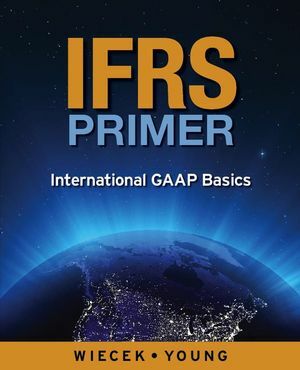 The IFRS Primer: International GAAP Basics serves as a roadmap to provide guidance and a path through the period of transition for both students and instructors. The IFRS Primer covers an introduction to IFRS basics and is a stand-alone volume, which is a logical supplement for use with existing Canadian or U.S. introductory, intermediate and advanced financial accounting textbooks. While the chapter content does not directly discuss differences between Canadian accounting standards and IFRS or U.S. standards and IFRS, chapter icons identify where there are significant differences and an appendix explains the major differences. Irene M. Wiecek, FCA is a faculty member of the University of Toronto at Mississauga and is cross-appointed to the Joseph L. Rotman School of Management. She teaches financial reporting in various programs including the Commerce Program (Accounting Specialist) and the Master of Management & Professional Accounting Program (MMPA). The Associate Director of the MMPA Program for many years, she co-founded and is Co-Director of the ICAO/Rotman Centre for Innovation in Accounting Education, which supports and facilitates innovation in accounting education. Irene has been involved in professional accounting education for over twenty years both at the Institute of Chartered Accountants of Ontario and the CICA, teaching and developing case/program material in various programs including the ICAO School of Accountancy. She helped create and currently directs the CICA In-depth GAAP Program. In the area of standard setting, she is Chair of the Canadian Academic Accounting Association Financial Accounting Exposure Draft Response Committee (since 2002). Irene is a member of the CICA Qualifications Committee which provides leadership, direction and standards for admission into the CA profession. She is the recipient of the MMPA Faculty of the Year award for 2004 and 2006. Nicola (Nickie) M. Young, MBA, FCA is a Professor of Accounting in the Sobey School of Business at Saint Mary's University in Halifax, Nova Scotia where her teaching responsibilities have varied from the introductory offering to final year advanced financial accounting courses to the survey course in the Executive MBA program. She is the recipient of teaching awards, and has contributed to the academic and administrative life of the university through chairing the Department of Accounting, membership on the Board of Governors, the Pension and other Committees. Nickie was associated with the Atlantic School of Chartered Accountancy for over twenty-five years in a variety of roles, including program and course development, teaching, and program reform. ?In addition to contributions to the accounting profession at the provincial level, Nickie has served on national boards of the Canadian Institute of Chartered Accountants (CICA) dealing with licensure and education. For the last fifteen years, she has worked with the CICA's Public Sector Accounting Board (PSAB) as an Associate, as a member and chair of the Board, and as chair and member of PSAB Task Forces. Each chapter begins by identifying the specific IFRS section, and its Canadian and U.S. counterparts, followed by a list of other IFRSs related to the chapter topic. The content of each chapter usually follows the same headings as used in the IASB statement: objective and scope, recognition, measurement, etc. Illustrations and tables are included to enhance students’ understanding with walkthrough mini scenarios and mini exercises interspersed throughout the chapter. Short excerpts/note disclosures from actual financial statements prepared under IFRS are provided. End of chapter material contains quantitative mini-exercises and qualitative mini-scenarios based primarily on unfamiliar or different requirements than those that exist under Canadian and U.S. GAAP now. The Instructor Resource Site includes Instructor's Manual with solutions and Interactive Power Point Slides. This title is available with WileyPLUS, an integrated suite of resources including the full online version of the textbook, plus easy-to-use homework management tools, interactive presentation resources, and a range of practice and study activities--with instant feedback--for your students.